bolstering the company’s energy grid, and thereby customer reliability. Duke Energy plans to invest this amount in its battery energy storage projects that come with an electricity generation capacity of 300 megawatts (MW). The planned $500 million investments in the Carolinas are anticipated to increase battery storage up to or more than 20 times in next 15 years. This will significantly enable Duke Energy to defer traditional grid upgrades to both residential and commercial customers in the region. Further, the company can maximize the battery storage technologies to include other customers. This will expand Duke Energy’s customer base, which, in turn, would boost the company’s top line. The trend of storing energy is on the rise. Energy storage helps in increasing the resilience of the grid, and enable companies to cater to higher demand during lower production of electricity. Excess energy produced from renewable sources are generally stored in the battery and used when demand is high. This lessens the production of electricity from fossil fuel. Unlike fossil fuels, alternate energy sources are dependent on weather conditions, which makes energy storage essential. Battery storage lowers emission as it cuts dependence on fossil fuel-based production. As a result, utilities that support the shift to clean energy movement are increasingly investing into battery energy storage projects. Per U.S. Energy Information Administration (EIA), at the end of 2017, 708 MW of power capacity, which represents 867 MWh of energy capacity of large-scale, battery storage capacity, was utilized. Realizing the growth prospects of this market, many states, including North and South Carolina, have made it mandatory for utilities to include storage in their integrated resource plans. Keeping this in consideration, Duke Energy recently filed for a Certificate of Public Convenience and Necessity with the North Carolina Utilities Commission for a Solar PV project in the Hot Springs community of Madison County as part of a micro-grid project. This project also features a 4MW lithium-based battery storage facility. To reap the benefits of the expanding battery energy storage market, other prominent utilities like PG&E Corp. PCG and NextEra Energy NEE are also investing in battery storage projects. Considering the aforementioned developments, we may expect more battery storage units to be installed across the United States due to higher electricity production from renewable sources. Duke Energy has lost 5.2% in the last 12 months, against the industry’s decline of 4.3%. The underperformance may have been caused by the potential volatility in market prices of fuel, electricity and other renewable energy commodities. 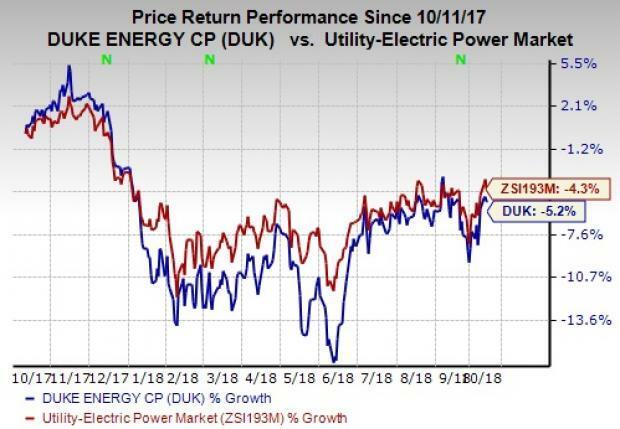 Duke Energy currently has a Zacks Rank #4 (Sell). A better-ranked stock in the same space is Ameren Corp. AEE, which carries a Zacks Rank #2 (Buy). You can see the complete list of today’s Zacks #1 Rank (Strong Buy) stocks here. Ameren delivered an average positive earnings surprise of 9.76% in the last four quarters. The Zacks Consensus Estimate for current-year earnings has been revised 1.3% upward to $3.25 per share over the past 30 days.